More traffic of every kind than at any other time of year in the USA. Plan for it! The week of Thanksgiving (late November) is the busiest travel time of the entire year in the USA. Because of the hundreds of boarding schools, colleges and universities in the six New England states, with tens of thousands of students wanting to go home for the Thanksgiving holiday, transport of every kind is heavily booked...and sometimes over-booked. Also, fares for flights, buses and trains are higher the closer you get to the holiday itself (4th Thursday in November). The Wednesday before and the Sunday after are the worst days; Tuesday and Saturday are almost as bad. But here's the good news: because so many people plan travel for just before and just after Thanksgiving, most don't plan travel for the week before or the week after Thanksgiving. Thus, mid-November and the end of of November through the first 10 days of December consitute a mini-low season for travel. If you plan your trip to New England for these times you will pay lower fares, and wlll have a greater choice of seats and departures. If your schedule requires you to travel during Thanksgiving week, PLAN AHEAD! Make your bus, train or plane resrvations well—months!—in advance if at all possible. Car travel offers no great advantage over train, plane or bus because auto traffic, especially through Connecticut on the Interstate-84 highway, is extremely heavy, slow, and more dangerous. The links below will give you much more information on transportation options in New England. 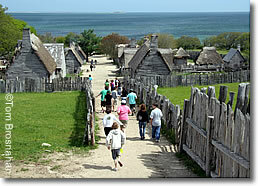 It was easy for the Pilgrims at Plimoth Plantation: they walked.